President Felipe Calderón congratulated Mexican golfer Lorena Ochoa on being declared Player of the Year by the Ladies’ Professional Golfers’ Association (LPGA) for coming second in the Tour Championship. The President telephoned Lorena Ochoa to say that this award is an example for Mexicans since it shows that with perseverance and discipline it is possible to achieve any goal. 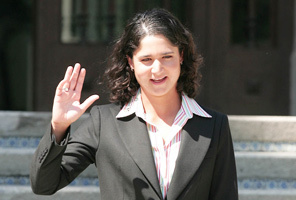 Lorena Ochoa has now won this prize for the fourth consecutive year.